The first time that I got to taste a croissant was during my high school years. There was a bakeshop in front of our street where croissants were being sold. My favorite then was the Ham & Cheese Croissant. When that bakeshop transferred to a different location, I haven't had a chance to taste a croissant again. So when I heard that there's a new pastry that is called CRONUT, I got curious. Cronut is a croissant-doughnut hybrid that originally came all the way from New York by Dominique Ansel Bakery. When it became a hit, different versions were already made until it reached us here in the Philippines. Coffee, tea, or pastry shops are offering these nowadays. Like Dolcelatte, Chatime, Le Coeur de France, Krispy Kreme, and Dunkin' Donuts. Yes, Dunkin' Donuts it is! They have selected branches where they sell different flavors of Donut Croissant. 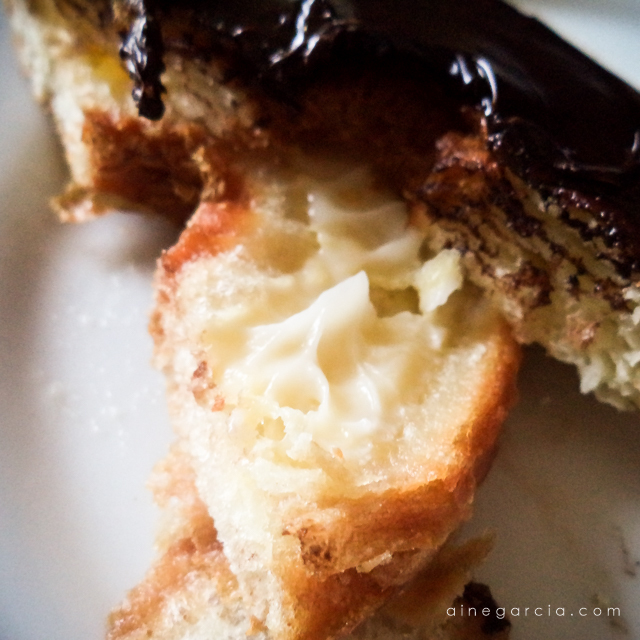 When I went to Glorietta, I saw their kiosk and I hurriedly checked if they're selling cronuts. And they are, for Php75! So I got one for myself to have a tasteful experience of the famous CRONUTS. I chose Choco Bavarian, because of THE Bavarian - my all-time favorite! 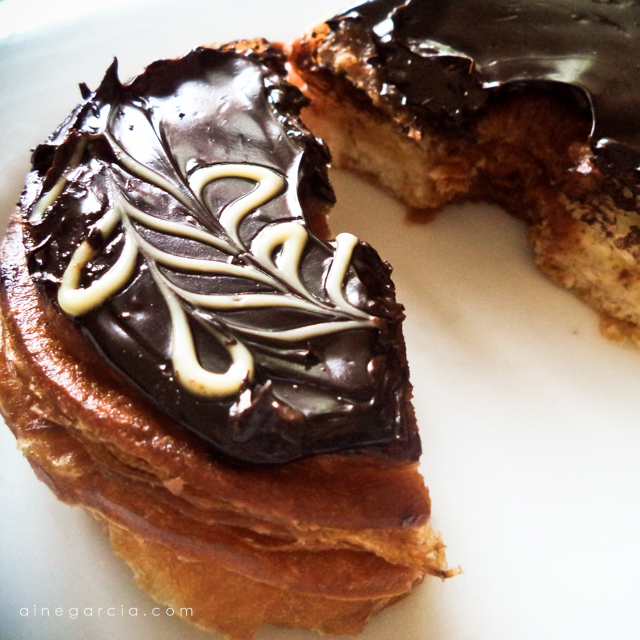 The dough is croissant-like and in doughnut-shape. I presume that it was also fried just like how doughnuts are created. The chocolate tasted more of the dark one. 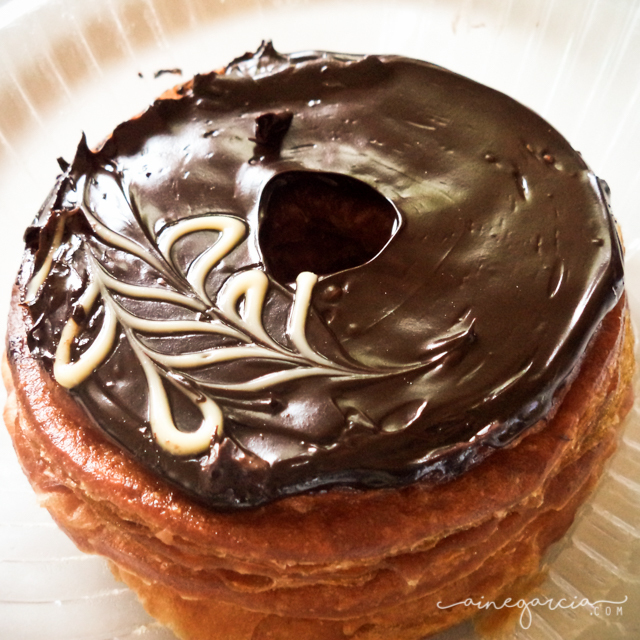 I was actually expecting that it tasted like the chocolate on top of Dunkin' Donuts Boston Kreme, LOL! There was also the Bavarian filling. Since this is my first, I cannot pretty much say if I tasted a 5-star cronut because I have no point of comparison for it. But for me, it tasted good!